We are excited to share preliminary results from the two quick build projects we launched last fall in the Historic Northeast in partnership with Children’s Mercy Kansas City, the KCMO Public Works Department, and K&G Striping. As you might recall, BikeWalkKC was awarded a grant from the Aetna Foundation in late 2017 to conduct community interventions and a program evaluation in Northeast KCMO. In partnership with Children’s Mercy Kansas City, BikeWalkKC conducted an evaluation of two quick build projects to measure community attitudes and perceptions, as well as traffic and pedestrian volumes before and after these temporary built environment projects. BikeWalkKC chose two intersections in Northeast Kansas City, identified through community member and stakeholder input: 1.) Van Brunt & St. John and 2.) 10th & Benton. The designs aimed at slowing traffic and creating a safer, more inviting environment for pedestrians. 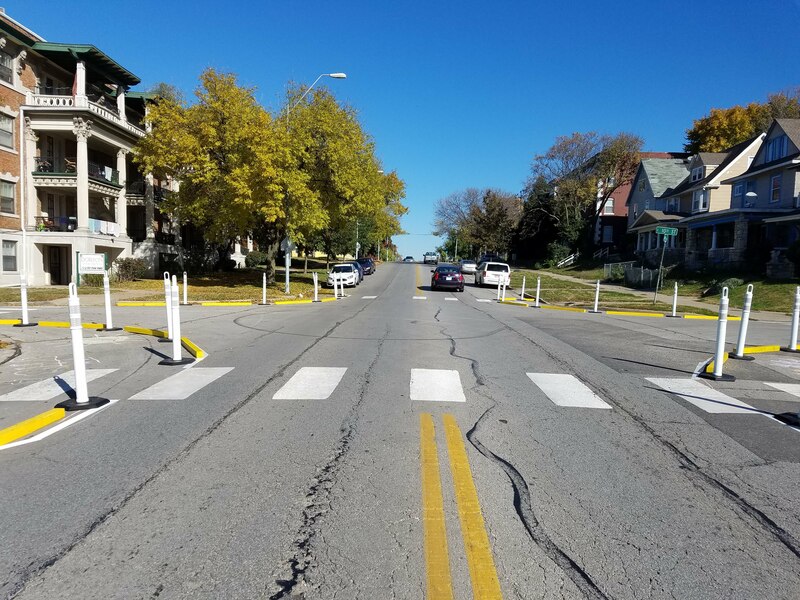 These projects included temporary bump outs to narrow the vehicle traffic lanes and shorten the crossing distance for pedestrians and painting of permanent crosswalks by the Kansas City Missouri Public Works Department. The bump-outs were in place for seven days at each location, from a Saturday to Saturday, and a kick-off event was held during the first day of each implementation. Nearly 85% of survey respondents said they want to see more bike/ped safety improvements in their neighborhoods. traffic calming improves neighborhood safety, connectivity, and mobility. Residents want to choose active transportation, but they also want to feel safe when they move through their community. Traffic calming can help with that. We are grateful to our partners that worked on this quick build traffic calming project with us: The Aetna Foundation, Children’s Mercy Kansas City, KCMO Public Works, K&G Striping, and many neighborhood associations and individuals supported this effort with their time, talent, and dedication to safer, more vibrant neighborhoods. The partnership around this project, the study results, and feedback from community members will inform our work in the future. Posted in Aetna, Local, News, Walking and tagged advocacy, Aetna, NortheastKCMO, pedestrian.